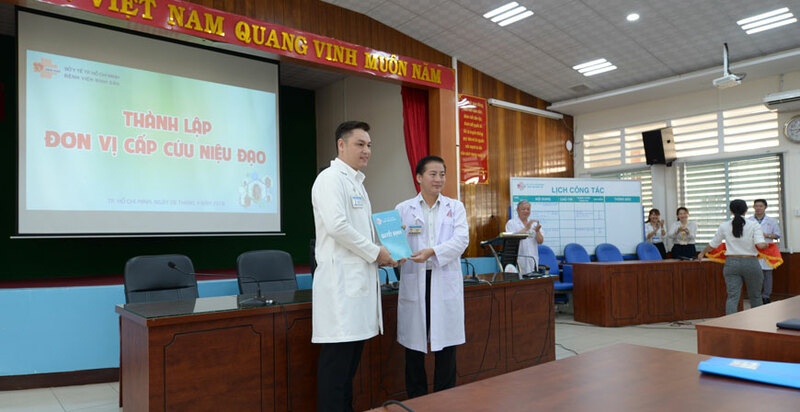 During our 2018 Annual International Outreach Trip to Saigon, Vietnam, Dr. Hung Do was formally named the Director of the first Department of Male Reconstructive Urology in Vietnam at the Binh Dan Hospital with a focus on urethroplasty (urethral stricture repair surgery). For the first time, in addition to Vietnamese Urologists, our workshop and surgeries were attended by Reconstructive Urologists from Australia, Indonesia, and Hong Kong who travelled to Saigon to benefit from Dr. Gelman’s urethroplasty expertise, especially in the management of urethral strictures from motor bike accidents (torn urethras). Dr. Gelman travelled to New Delhi, India to volunteer to perform several complex urethral stricture surgeries to repair bulbar urethral strictures due to urethral trauma. In addition, Dr. Gelman provided several lectures to teach the doctors from India how to properly perform retrograde urethrograms, (imaging studies of the urethra that define the length and location of the urethral strictures) and an overview of the management of urethral strictures along with urethroplasty techniques. The Center for Reconstructive Urology is fully committed to outreach. We are dedicated to sharing our expertise in ways that help address the critical medical needs of disadvantaged communities in various parts of the world. How has CFRU delivered on this commitment over the years? The posts in this section provide some specific examples.